Little Man-1976 black spotted blanket Falabella. Sired by Repollo (r), out of Calliope (r). Bred by Shadow Wolf Stables. The Dream King-1986 bay. Sired by Komokos Little King Supreme (r), out of Komokos Dream Girl (r). Lined bred to Komokos King Tut. ​2005-Crashing The Party, flaxe chestnut filly (x Thumbalina) o/b Twin Springs Stables. 2007-Miko's Black Lady, black sabino filly (x Scouts Black Lady) o/b Twin Springs Stables. Poor Man Out-1995 bay varnish roan spotted blanket Falabella. Sired by Rancho Casa Bellas Chianti (r) out of Toyland China (r). Bred by Shadow Wolf Stables. Tuck-1996 buckskin Falabella. Sired by Toyland Domino (r), out of Toyland China (r). Bred by Shadow Wolf Stables. Steppin Out In Syn-2005 bay silver. Sired by WF Steppin Out (r), out of Aint She Cinsational (r). Volcanic Jazz Tyme-2011 flaxen chestnut frame overo and sabino Miniature Horse stallion. 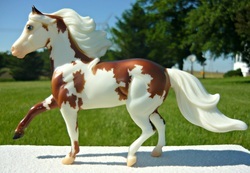 Sired by AF Gold Mine, out of Tiny Toy Robin's Jazzy Girl. Bred by Caballos del Mar. 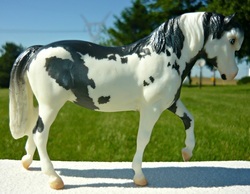 Kingdom's Magical Song-2012 black frame overo and sabino Miniature Horse stallion. Sired by Tiny Toy Superman, out of Tiny Toy Robin's Jazzy Girl. Bred by Caballos del Mar.